The following is the final report of Mars Desert Research Station Crew 164. A full review of this year's MDRS activity will be given at the 19th Annual International Mars Society Convention, scheduled for September 22-25, 2016 at the Catholic University of America, Washington, D.C. 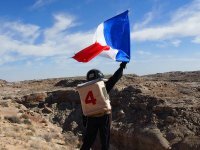 Crew 164, the MDRS Supaero Crew is comprised of six students from ISAE-Supaero, a leading Aerospace Engineering school in France. Mohammad Iranmanesh and Mehdi Scoubeau, former Crew 151 members gathered a team with people of complementary skills among the students of the school and these are: Camille Gontier, Jérémy Rabineau, Louis Maller and Arthur Lillo. Together, they worked on many and varied experiments in Technologies, Human Factors, Earth Sciences and Astronomy in a simulated Martian base that they helped keep in a good shape. The purpose of this study is to explore the link between the electrocardiogram activity of an astronaut doing various tasks, in EVA as well as inside the Hab, and his attention and awareness level. which pupil diameter monitoring using an eye-tracking device could be an effective mean to detect the apparition of mind-wandering. Therefore, the experiment aimed at verifying that other and more easily recordable signals, and especially ECG signal, could also be used to monitor awareness levels in an ecologically valid environment. The PI wore, during his EVA and HabCom times, an ECG device. He regularly assessed his attention level using self-probes and artificial thought probes, and synchronized them with ECG signal. Data analysis will be conducted after the mission using statistical analysis software such as R. They expect to find a significant variation of heart rate variability with attention levels. The Personal Assistant for Marsonaut (PAM) is designed as an application for a digital tablet that is meant to help the astronaut in his/her everyday life. It is a hub for the different bio-medical sensors and can make a follow-up concerning the following subjects: nutrition, sleep and health condition. During the simulation, only the part dedicated to the nutritional follow-up has been used. The main purpose was to evaluate the ergonomics of this part of the tool. After having stuck barcodes on all the food items they had, one crew member scanned everything he ate. Once everything was prepared, it was quite fast to scan everything for a meal. However, it was sometimes hard to identify all the ingredients and to evaluate their proportions, especially when the user of the tool had not cooked the meal. As long as the PAM is within hand reach, the ergonomics of the nutritional follow-up has been proven. But it would surely be far more user-friendly with individual meals such as on the ISS, where it will eventually be used by European astronauts. The aim of this experiment is to monitor the opacity of the Martian atmosphere in order to learn more about the composition of the atmosphere and its evolution over time on a daily and seasonal basis. This parameter can also be used for operational needs like forecasting the solar panel efficiency, for example. On Mars, this value has already been measured at different wavelengths by Viking Lander missions and Mars Pathfinder. It allowed the scientific community to emphasize the presence of particle of water ice aerosols and dust. In this particular case, the objective of this experiment is to determine and monitor the opacity during the day. A comparison between the data retrieved from this experiment and the actual value known by the Planetary Sciences and Radiative Transfer experts is now planned to see how close to the real value one can get using reasonably cheap means. The aim of this experiment was to gather data for further improvements for a recording interface for space suits currently developed by Alexandre Mangeot from Association Planète Mars (French chapter of the Mars Society). They took the prototype (a device made of a Raspberry Pi computer, and temperature, hygrometry and luminosity sensors) during each EVA for data recording. In the same time, EVA parameters (time, temperature, nebulosity, and route) were written down for verification of accuracy of prototype’s recordings, which will be analyzed after the mission. Tests in Mars-analog conditions at the MDRS allow for efficiency and usability assessments. It comes within the scope of previous experiments aiming at recording data from Marsonauts, in the Hab (NEEMO project) as well as during EVAs (personal assistant currently developed at the CNES). Alexandre Mangeot expects to have the final system, with a functional graphical interface, fully operational for the Mars Arctic 365 mission. - A time widget was displayed on the home screen of the glasses, so it was constantly visible for the astronaut. - Pictures are taken through the helmet, which is much more practical than using an ungainly camera with astronaut gloves. - Displaying a map. Coupled with a GPS tracking of astronaut’s positions this could become extremely useful during EVAs. - Displaying a procedure. This feature was successfully tested during a geology experiment. The steps of the protocol were pre-programmed in the glasses and were therefore accessible with simple vocal commands. - Notes can be spoken out loud and transcribed by the app in order to document an activity in a hands-free way. However, the glasses have some difficulties with some words, particularly numbers or scientific words. - A vocal battery level alert was implemented. All in all, many features are very promising and truly improve the EVA experience. Some issues need to be solved, such as the method of control, and also the comfort of the glasses, which are quite bulky. But as this technology becomes more mature, it will probably be truly implemented on actual EVA helmets. This project was delayed by a problem on the telescope. The crew astronomer had to proceed to a collimation of the telescope to fix this issue. Afterwards, the eight objects of the selection in the “Stellar Evolution Observing Program” were plainly visible thanks to the clear sky of Utah: Orion Nebula, Aldebaran, Algol, Betelgeuse, Tau Ceti, the Pleiades, the Eskimo Nebula and the Crab Nebula. However, the photography part of the project could not be achieved because of a technical problem on the adapted DSLR camera that they brought with them. On a more positive note, they took wide-angle pictures of the Milky Way with another camera, revealing the vertiginous amount of stars in the desert’s sky. Since drones were not allowed during this rotation, the payload prepared initially for LOCARD 2 had to be transferred to the CRV experimental platform at the last minute before the mission. The main improvement brought to the CRV was the replacement of the wired video system by a WIFI wide angle camera system. The new system was successful but due to the changes in the payload, more work had to be done in situ to rebalance the assembly. In addition, it was found that such platform needs a system that would allow the astronaut to steer it left and right during its descent on the cliff. The radio repeater system was not successful because of damaged electronics during transfer. The modular electronic board on the CRV allowed Crew 164 to add quickly a humidity and temperature sensor to the CRV in order to have more information than just the video feed on the areas of interest during an EVA. During its rotation, the crew noticed a broken plastic part in the loft water pump. With CapCom authorization, they designed a similar piece using CAO and printed it with the 3D printer inside the Hab. The repair was a success and a first at MDRS. The water pump is now functioning well with a 3D printed part that will last longer since it is even more resistant. The crew members worked as volunteers on Heidi Beemer’s experiment. Heidi Beemer is a master student at ERAU and former MDRS crew member. Her project aimed at determining if social and psychological fasters will affect an astronaut team performing the RMR task for future colonization of Mars. The Rock Mass Rating (RMR) System is a geomechanical classification system for rock layers, mainly used for the design and construction of excavations in rock, such as tunnels and foundations. Tunnels are important for Mars exploration because once enough people have colonized Mars; a more permanent solution for housing will be needed. These living areas will need to protect occupants from radiation. By using factors of natural shielding, tunnels may present one of the best ways to attain this protection. Each team member was randomly assigned a team role as either the Navigator, Geologist, or Recorder and conducts six basic geologic tasks during an EVA 400 meters from the Hab. So far, the evaluation they took showed very good results.